Planting young trees and garden plants entered a new era when the Groasis Waterboxx PlantCocoon (or Waterboxx for short) was invented. The Waterboxx allows rain and dew to be harvested from the air, decreasing or eliminating the need for outside watering of plants in all but the driest climates. 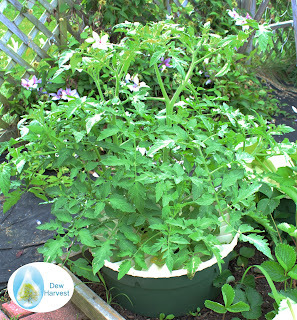 This blog will document the successes of using the Waterboxx to grow trees and garden plants without continued watering. The Groasis Waterboxx is an incredible invention. It allows the growing of many garden plants, like peppers and tomatoes, with potentially no water added after planting. Two Parks Improved Whopper Hybrid Tomatoes - which together produced over 100 fruit without any watering after planting, with the Waterboxx. Plants can grow astoundingly tall with the Waterboxx. 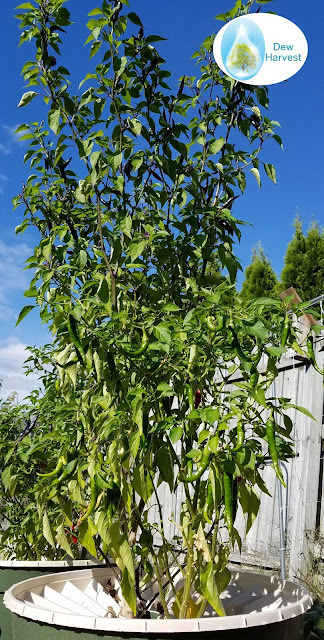 Two cayenne (chili) peppers in a Waterboxx - which produced 361 full sized peppers without any water after planting thanks to the Waterboxx. The Waterboxx ships with its different components stacked within each other, taking up far less space. This does mean that some assembly is required. So, how is the Waterboxx assembled? The Waterboxx can be cleaned after each use and reused for up to 10 years. You can learn how to grow almost every garden plant with the Waterboxx - including tomatoes, peppers, squash, melons, eggplants, flowers, and greens like lettuce, kale, arugula and spinach with our book - The Waterboxx Gardener: How to Mimic Nature, Stop Watering, and Start Enjoying Your Garden available on Amazon.com here. Arid Agriculture is a platform to learn and promote agricultural sciences as a career and vegetable gardening at home and small scale. Do Trees Make It Rain? See Something You Like - Pin It! At Dew Harvest, we are plant lovers. When we discovered a device called the Groasis Waterboxx, we became dedicated to educating people about its ability to plant trees and garden plants in arid areas. Our blogs will be dedicated to the utilization of the Groasis Waterboxx and similar technology in planting and growing trees and garden plants. Dew Harvest® 2013-2014. Simple theme. Theme images by gaffera. Powered by Blogger.